It’s not every Sunday evening two massive cruise-ships, or floating hotels, embark and dock at Circular Quay. Nor is it every Sunday that Ornette Coleman plays at the Opera House. As the ship spotters moved about the harbour foreshore, enjoying the sun, bands and … big ships … a segment of the crowd made its way to the Concert Hall to hear one of the remaining legends of jazz. Among the expectant concert-goers were drummer John Pochee, “Freebopper” Mark Simmons, saxophonist Matt Ottignon and pianist Alister Spence. As an appetiser we were treated to the music of Mark Atkins. As Coleman has played with the Joujouka musicians of Africa and expressed an interest in touring the Northern Territory it was a pity Atkins and Coleman didn’t play together. Not a show-off by any means, Atkins’ didgeridoo playing was evocative and summoned the spirit of the outback. One piece told of a showdown between emu and dog. There was the dog’s bark as it hunted the emu and the emu’s laughter as it outwitted the dog. These sound effects were superimposed on long undulating drones. Atkins also demonstrated that he can play a major third – a technical feat that Coltrane could do on his tenor sax. Atkins also called upon his days as a rhythm guitarist while accompanying himself on didj – a feat that must require a great deal of dexterity and concentration. After a brief interval the doyen of progressive improvisation appeared. 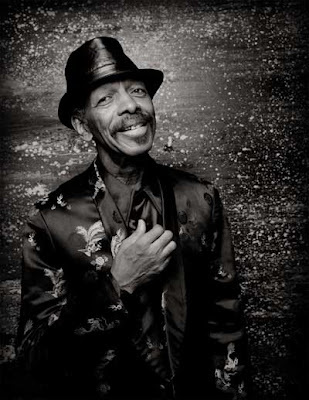 Ornette Coleman shuffled slowly on stage in a dapper blue suit, without his trademark hat, and spoke softly into the microphone. Any hints of feebleness were swiftly dashed as his band, which included two electric basses and one acoustic bass, with son Denardo on drums, launched into a typical Coleman tune – flighty, ethereal, at times lyrical then percussive – which seemed to be over soon after it started. Whether his compositions are short and packed with meaning, or whether I was simply lifted by the waves of sound and fell into a trance I cannot say. Coleman knows how to end a tune – the abrupt, but very tight finishes were always unexpected, whimsical, statement making, and entirely appropriate for jazz. Not like Coltrane’s habit of winding up and down modes when the piece is ending. Coleman’s abrupt endings signify the duality between the musical world of ideas and the blanket of silence that envelopes and jerks the listener back to reality. Coleman’s melodic lines often floated around the perfect fifth and minor third, with suggestions of a pull back to a tonic. His inflections over the perfect fifth were lyrical and tapped raw emotion. The basses never sounded extraneous or busy. The acoustic bass was often bowed, while one electric bass played fast walking bass lines and the other was played almost like a guitar, achieving a soft, rounded and subtle sound. The counterpoint of three basses was exciting and a full of momentum. While Denardo’s drumming was fast it wasn’t frenetic, and left plenty of room for statements from Coleman and the bass players. Conventional jazz idioms, such as walking bass and swing were not overused. Denardo often played straight 8s on the ride cymbal and against this regular pattern would emerge Ornette’s solos – within the frame, but not confined to the beat. It is hard to put your finger on his sense of swing. When he plays fast runs the beat is certain. When he is lilting around a note he has fixated on or puncturing notes in the air the swing is less certain. At times the music swung hard and would have suited the intimacy of a jazz club, but Coleman can not be pigeonholed easily. Some compositions, usually the slower ones, were right at home in the concert hall, as if the quintet had transformed into a chamber group. Classical themes explored included Stravinsky’s Rite of Spring, Bach’s Cello Suit and Amazing Grace. Ornette Coleman briefly played the violin in one of his pieces, getting a shimmering sound from rapid tremolo. His trumpet work was very interesting. It seemed as if one instrument melded into another – the transitions between the two instruments were not blatantly noticeable, but rather changed the atmosphere. Several times he elicited chuckles from the audience as he put his saxophone down and emitted some sharp animalistic sounds on the trumpet. This was a very refreshing concert. He duly gave the audience their wanted encore, finishing with Lonely Woman. The Necks are jazz players, but what they perform is a haunting, mesmeric, hypnotic form of ambient soundscaping that breaks from traditions and audience to find new sounds and new devotees. These guys have become stars, with international acclaim and numerous CDs to their name. I knew something of what to expect when I attended. I’d heard some Necks on CD, and watched a TV broadcast of a set, and for what it’s worth, had seen Lloyd Swanton several times in other incarnations. The Necks were a favourite of a post-seminary sax player I once knew, but I’d found them too macrocosmic or ecospheric for my philosophically materialist tastes. After two sets, I was much impressed, if not a spiritual convert. In the end, art’s still a matter of taste, but this was deeply intriguing stuff. The Necks are a piano trio, but not a common one. Most obviously, each set was a long, apparently free, improvisation. From the start, I noticed the regularity and precision of the minimal bass riff over long repetitions: none too easy to achieve. And the busy and repetitive scalar runs on the piano. The tune developed as four chords against a bass pedal, initially in 4/4 with some simple bass syncopation. The drums took a while to join in (nothing happens too suddenly here), then a busy bass drum which felt like it was expressing a melody, but there was none elsewhere. All the while, I was being lured, siren like, into this growing maelstrom of restrained tension. Then there were voices, but no singers, and strings, but there were none. Where were these sounds from? I listened, but still couldn’t find the source. (In the foyer at the interval, someone suggested recordings, but I trusted the players more than that). Sometimes I could pick a busy high-pitched piano pattern with softly, softly attack which formed the mysterious tonality. Another time, I realised it was a tapped bass E string, played while Lloyd was otherwise bowing. But oftentimes, these sounds were quite undiscoverable. The piano had dissolved into attack-free tonalities: sometimes organic; sometimes unearthly, synthetic, like orchestration for ‘50s sci-fi movies. In the end, I put it down to resonances, primarily in the piano, a big, hefty grand which presumably resonates richly. The intensity and busy-ness was there to create resonances, and the level was sufficiently low to hear them. Listening on, we were in 6/4, with a hornet’s nest of buzzing, beating regularity. There had been change, but who’d noticed? This was minimal, but ambient more than minimalist; I expected maybe Philp Glass arpeggiation, but this was more scalar; not chordal, although there were repeating, simple, disguised chord patterns accompanied by bass pedals. And no melody at all that I could hear. The second set had similar intellectual and emotional responses. The bass was bowed; the drums more rattled; the piano sounds were repeated, this time hinting at your first explorations of endless loops and echo units with a call and response theme on piano. The sound grew in intensity and volume, then receded to end after another hypnotic hour. Hour? Yep. This one seemed shorter; the audience seemed more attuned. As I left, someone commented that he’d wanted to laugh with “sensory overload”. His girlfriend admonished him. Not jazz like I know, but performed by capable players. All listening: no visual cues in sight. Ambient and minimal; hypnotic and attractive; mysterious and tonally deceptive; beautiful and even refreshing. Many would say spiritual (a hackneyed and misused adjective). Ambient is not something I’d choose every night, but The Necks were engrossing and satisfying and much recommended. The Necks are Lloyd Swanton (bass), Chris Abrahams (piano) and Tony Buck (drums). Chris Deacon invited me down to the Manuka studio for the first recording for ArtSound’s new live in the studio sessions. These sessions will include live studio recordings and selected concerts from the large collection of live recordings that ArtSound have been making over many years. The new studios are much improved on the old facilities at Curtin. They offer a great opportunity for local musicians to perform for their public and to make professional-quality recordings. I was lucky enough to catch Niels Rosendahl (tenor sax) playing with Jazz School mates, Ed Rodriques (drums) and Bill Williams (bass). Chris Deacon was engineering. Niels Rosendahl has been based in London or the last few years. He’s a sad loss to Canberra, but certainly a great ambassador. His playing matures each time he makes a visit back home, so it’s a pleasure to catch up with him. He was talking of touring in Europe with the Rat Pack Show (Rat Pack as in Sinatra & co, I assume) and with the Glen Miller Memorial Orchestra, playing Glen Miller tunes and other big band swing. Interestingly, he reported that Craig Schneider (cabaret pianist, musical director and fellow Canberran and Jazz School alumnus) is with the Scandinavian branch of the Rat Pack Show. The recording was a session of standards. I caught the second set: Beautiful love, John Carisi’s Israel, Round midnight morphing into Have you met Miss Jones, Stella by starlight, Tenor madness and Someday my prince will come. Obvious tunes, but played with an impressive modernistic vision. Niels sounded wonderfully relaxed, with long sustained lines, modal patterns, and gloriously reshaped melodies. This was not generally out playing, but melodies were anticipated and twisted and changed in emotionally satisfying ways and solos were considered investigations of the underlying harmonies. This was a long way post bop; lovely playing. And Ed and Bill were there with him. Bill’s walks were lessons in interest. The underlying harmony is there, but the four-note patterns which define the bass walk were ever changing, seldom obvious or hackneyed. Bill has told me of his efforts to make his walks interesting. He’s doing a good job. Ed is always responsive to fellow players: smiling, watching, interpreting. The studio is a less alive environment, especially for a drummer sandwiched behind glass and gobbos, but he’s still communicative and subtle in his stick and brush work. They were all wrung out by the intensity of a studio session, and complaining about their playing. If you know musos, complaints are plenty common. But I’ll beg to differ. This was a level above the much of the everyday local scene, with authentic modernistic interpretations of these otherwise common tunes. Keep your ears open for more from ArtSound. Going hand in hand with live studio recordings, I hear that AS is joining a European network which will provide Euro jazz for performance in Canberra, but also take our best recordings for broadcast in Europe. For this, read new audiences for our best local players. AS is a great force for good for jazz in Canberra. Congrats and thanks. Latin is a key component in the stylistic repertoire of jazz. Tango is Argentina’s version of latin, and Astor Piazzolla is tango’s great composer. So I was interested to attend a minor opera, in a style called Tango Operita, which had two outings under the musical direction of Marcela Fiorillo at the Multicultural Festival. Marcela’s an interesting story and a great addition to the Canberra musical scene. She is Argentinian-born and a former professor in the piano department at the Superior Conservatory of Music “Manuel de Falla” in Buenos Aires. Apparently she met her mate in Canberra, and now lives here. It’s a pleasing story of internationalism, and one very much to Canberra’s advantage. Canberra is like that: understated, but over-represented with capable and interesting people. I guess it’s the way of the bureaucrat. The operita was Maria de Buenos Aires, with music by Astor Piazzolla and a libretto by Horacio Ferrer. It tells a strange and sometimes amusing story with obvious references to Maria as Madonna, but also as the personification of the tango and the city. Maria goes to the heart of Buenos Aires, visits the sewers, becomes a prostitute, dies, attends a psychoanalyst, is resurrected and eventually has a child who is not Jesus but another baby Maria, perhaps the self-same Maria resurrected from her own shadow by the love of the Goblin. Mmm … such is opera. The cast included Marcela on piano, three voices, six musicians, and a mixed choir of eight (details below). I have various impressions. The latin rhythm and the low ranges of the voices, the rough but so apt performance of the small male and female choirs, the frequency and rhythm of Spanish speech (the goblin only spoke, the choir spoke its lines). The performers were classically trained, but there was close relation to jazz forms. Marcela’s parts were presumably fully written. It interested me that it was spot on for what I’d expect from a good jazz pianist improvising from a much sparser lead sheet. But what reading skills! As for reading, the violin had a busy job too, and performed it with panache. This was a thing of real beauty. The flautist also featured on the diminutive piccolo, and the cello was busy with feature melodies. I don’t picture classical players performing latin with ease, but this seemed authentic and was certainly satisfying. Perhaps this is a travesty, but I would have liked to have heard a jazz drum kit in there, but I’m sure it’s not written for that. This is essentially rhythmic music, and classical percussion doesn’t quite lock in the pocket or push the groove in the way jazz players do. But I was satisfied to see feet tapping on stage. The goblin tapped persistently and his spoken words were beautifully musical and rhythmic. Maria also tapped at times. The infectious grooves were insinuating themselves. As for the work itself, by the end I was finding it a bit repetitive. The rhythm varied (tango, waltz, and triplet feels like 12/8 and 9/8) but the chords were pretty repetitive, as were some melodies. Jazz uses similarly repetitive tunes, but empowers them through improvisation, so it’s alive and constantly changing. The written version provided some great solos, a surreal story, and wonderful playing, but towards the end, I came to think I’d heard the changes once too often. But there’s no doubting the performance. To perform a piece with this complexity with a non-standing group and with only two performances is stunning. Classical players do this every day, of course, and it’s a great strength. But it’s got its down side: not quite so close to the music, or quite so comfortable with it. The encore showed this dramatically, as they repeated a favourite song by Maria with relaxation and dynamics and flare that was missing from the serious part of the performance, where everyone was concentrating hard on a challenging task. There’s no questioning of the players here. They were fabulous and supremely competent, but you just can’t bring together something as complex as this for a few performances, and expect to perform it with the intimacy that comes from frequent performances by a standing ensemble. The performers were: Marcela Fiorillo (piano and musical director), Bronwyn Sullivan (vocals, Maria), Alejandro Machuron (vocals, Goblin), Eduardo Cogorno (vocals, various characters), Julian Smiles (cello), Dimity Hall (violin), Max McBride (bass), Virginia Taylor (flute, piccolo), Veronica Walshaw (percussion), Charles Martin (tuned percussion as in vibes, marimba), Ota de la Rocha, Cesar Molina, Javier Ribalta, Mabel Castro, Gabriela Cabral, Bibi Amstein, Carmen Diaz, James Gifford (chorus, various characters), Judy Clingan (choral director), Jorge Bagnini (artistic director). It was an interesting and entertaining night out, and a superb performance all round by these players. Stunning stuff, and surprisingly close to the jazz which is the raison d’etre of CJ. John Mackey’s Quartet grew to a sextet last night to send off Carl Morgan as he departs for Melbourne. As we expect from John, this was a greatly satisfying few sets of modern jazz in a fervid and fiery, early 60s style. Coltrane is always evident in John’s playing, and with trumpet and several of the back line John used for his Coltrane retrospective, this was a deeply satisfying gig for this lover of that period. I find it interesting how different players take your attention one night, then disappear into the woodwork another. There are probably various factors – the listener’s frame of mind, the player’s chops or commitment on the night, the sound or clarity or environment. As a bassist, I obviously take an inordinate interest in that instrument, but acoustic bass is so often hard to hear and so to distinguish note choices. Bass is often a thump that satisfies. The front liners are virtually always clear and distinguishable; the drums too. Piano can get lost, especially as Rhodes, but does better than bass. Last night, Mark Sutton’s drums were the focus for me. This was a performance of great mastery: freely interpreting melodies and structure; constantly churning beats and grooves against the underlying rhythm patterns; clean and clearly intentioned playing throughout. I also have a standing focus on sax. It’s the voice of jazz, doubly so for this period. I remember reading that to study soloing, regardless of your instrument, listen to the sax player. There’s some truth in this (although each instrument has its own limitations and characters and quirks which influence improvisation). Saxes seem to have it all – voice-like articulation, pitch and tonal variation, and a natural tendency to interesting phrasing. John was fast, impassioned, exploratory as always; sheets and sprays of chordal and melodic flurries over the full range of the horn; rich, rounded sounds and occasional quotes; and clear as a tutorial in effective modern playing. I loved his solo rendition of In a sentimental mood, which was all lone saxist leaning from NY loft window. But Mark and John were not alone. Miro was wonderfully structured and searching in his solos and throwaway flourishes. Carl threw chordal colours in with blistering guitar solo lines. Wayne was pensive on the night. I particularly liked his comping to John with mobile fourths tonalities. Chris is just entering 2nd year, but his tone is full, his intonation good, his beat accurate and steady, his walks fast, and his one short solo was impressive, too. The tunes were not ones I readily recognised. There was Pantano Drive, the title track from John’s CD, and perhaps others from this CD. There was at least one that sounded like it came from the pen of Miro. Even Sentimental mood, being solo sax, was well disguised. The jazz year is young, and I felt the night started pretty laid back, but it intensified even as the audience dissipated and the listeners took over. Quality playing and a favourite style made this a pleasure for me, and a fitting end to an emotionally satisfying national Sorry Day. John Mackey (tenor sax) played with Miroslav Bukovsky (trumpet), Carl Morgan (guitar), Wayne Kelly (piano), Chris Pound (bass) and Mark Sutton (drums). The Multicultural festival is here again, and there are a few artists I’m hoping to catch up with. Last night, I managed two at the Fringe Festival marquee in Civic Square: Circle of Fire and Tjupurru. The Fringe is a good place to see most of the visiting acts. It’s stylishly bohemian although it attracts all types, it’s free, and you have plenty of space and tent openings to move around, change your view, dance, chat, or just mill about. There’s seating too: tables and couches like a comfy lounge room, although I noticed the carpet was a bit squishy after recent rains. And it’s free. A nice combination. There are events on at the Fringe tent each evening for the next two weeks, from 7pm to late. See the program of acts at the Multicultural Festival’s site. Circle of Fire are three drummers: tabla, western kit (although not always played with standard technique) and mixed percussion. The players are Greg Sheehan, Bobby Singh and Ben Walsh (I’m not sure who’s who). This was rhythmic set, as you’d imagine. The call for quiet for a tabla feature, in recognition of his years of training, was rather twee in this festival environment, and the finale of two players alternating on western kit was showy, but it went over well as a performance. The show was popular, there were lots of dancers, and the rhythms were genuinely complex and interesting, although not hypnotic. The venue didn’t really lend itself to hypnotics, anyway. During and between the music sets we were presented with a performance art show of slowly moving bodies under colourful lighting. It certainly added more interest than the canvas curtain walls, and made for mobile and colourful surroundings. I understood this group was called Writer in a Box. Tjupurru followed with a set of modern, Aboriginal music, at least I guess that’s what it was. He essentially performed a one-man-band set with that mesmeric combination of didgeridoo and voice, but this had a very modern twist. The traditional was there with a self-confident Aboriginal pride and respect for the traditional owners of the land, but there was also a very modern black awareness. The didj was a slide instrument, it was wireless miked and amplified along with his voice, the richness of the corroborree was created by layering voice and didj with digital loops. This was the past brought into the present: a fascinating performance and pleasingly and genuinely Australia. And to confirm the Aboriginal pride, there was a good deal of politics, too: well received by the audience, and well matched to this time of Sorry saying and the hope that comes with a new government. Good music all round, and near enough for jazz. Sadly, the financial woes of the ANU School of Music came to a head this week. Apparently the Vice Chancellor, Ian Chubb, spoke to staff about their parlous state, and offered a few options for the future. The Jazz School is in bumptious good health, with a surplus of students wishing to enter each year. Sadly, the classical school is not so robust: it’s suffering from an widespread, international drop in students wishing to study Western fine music. The classical school was considered perhaps the top music school in Australia in its early days It was set up to cater for all orchestral instruments, and there lies its greatest threat. It seems that some areas are bringing in the students (Keyboard Institute, Jazz School and some others), but some teachers have only one or two students. I can understand the financial woes here, given each teacher is funded for a full workload. The options offered were to have teachers paid by student load (presumably meaning the departure of some teachers and contract work for many others), or to specialise in successful areas of study, including jazz and keyboards. This also has implications for our local professional orchestra, the Canberra Symphony Orchestra (CSO). Apparently the teachers at the school are the mainstay of this orchestra, so dropping support for the full range of instruments will limit the CSO’s ability to access players of a good standard. Our orchestra does not get the government support of professional orchestras interstate (which admittedly serve larger cities, and presumably larger audiences). So both the Music School and the CSO are currently being subsidised by the ANU, and thus other faculties. The future is looking bleak for the range and quality of music in Canberra, even if our branch, jazz, is thriving. It was a relaxing set from Leisa Keen at the Casino last night. Known standards played calmly, with no rush between tunes. I guess that’s appropriate. The crowd has other matters on its mind. This is the soothing background, although I’m not sure if it would do much good if you’re on a losing streak. Leisa told me she’s been working there for a year, and gets good reports from the croupiers like the relaxed jazz atmosphere. They are working at a frenzied pace, and need to keep their heads together, so I imagine it’s just the ticket/token/chip. I can’t provide a pic because cameras aren’t allowed. Strange, given the huge number of CCT cameras obviously ensconced in domes in the ceiling. But this is another, monied world. A bit tacky perhaps, but it pays and jazzers are getting two gigs a week, so that’s good. And there’s a little patch of bar area for a beer and a listen. Leisa Keen (vocals, piano) impressed by playing a range of tasks with considerable competence: singing and piano comping, bass lines and soloing. Nicely done. Her trio includes Graeme Reynolds (trumpet) and Ian McLean (drums), so there’s a nice range of tones here. Trumpet is a rarer beast out front, doubly so in trios, so we have a different sound. The tunes were well known standards: The way you look tonight, Almost like being in love, Autumn leaves, My baby just cares for me, Honeysuckle rose, Perhaps3, etc. Leisa’s website shows she’s active in a range of musical formats: choir, musical theatre, cabaret: quite a multi-talent. There are lots of young girls dressed up and blokes dressed down, as is the way. If you want a night on the gaming floor, or a hint of the greater glories of Monte Carlo or Las Vegas, entrance is free there’s some comformable background music from a range of local jazz outfits each Friday and Saturday evening from 9pm.